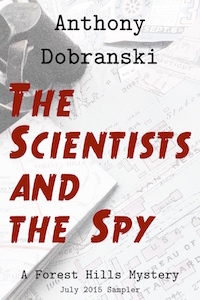 The Scientists and the Spy July ebook — out now! I’m excited to announce the new ebook edition of Chapters 1-10 of my serial The Scientists and the Spy! Weekly episodes are great, but now you can binge-read the last two months of this thrilling wartime mystery set in Washington DC. Includes all the period photos from the website, plus an afterword about writing historical fiction. Available in editions for all e-readers – download today! This entry was posted in fiction, novel and tagged announcement, download, download ebook, ebook, forest hills, forest hills connection, forest hills dc, National Bureau of Standards, National Institute of Standards and Technology, promotion, The scientists and the spy, world war 2, World War II, WWII, WWII homefront on July 1, 2015 by .